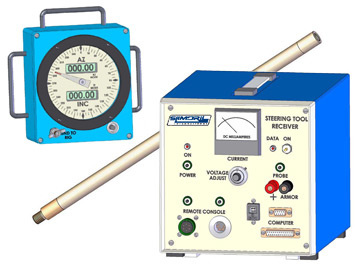 SlimDril's Wireline Steering Tool is a directional guidance system that provides real time positioning of the borehole. Sensors located within the downhole Probe provide constant updates of Inclination, Azimuth and Tool Face orientation to the surface via a wireline. The data is processed utilizing surface equipment (Interface Unit, Laptop Computer and Printer) and specialized Steering software to provide information on Depth, course length (Away) and distance off the predetermined azimuth (Right/Left). Verification of the location of the Probe and the accuracy of the survey can be improved using the Grid Tracking Surface Monitoring System. Grid Tracking is an independent secondary monitoring that incorporates an energized grid of wire laid on the surface to compensate for any magnetic inteference.